"Alexandria Ocasio-Cortez, born October 13, 1989, also known by her initials, AOC, is an American politician and member of the Democratic Party. 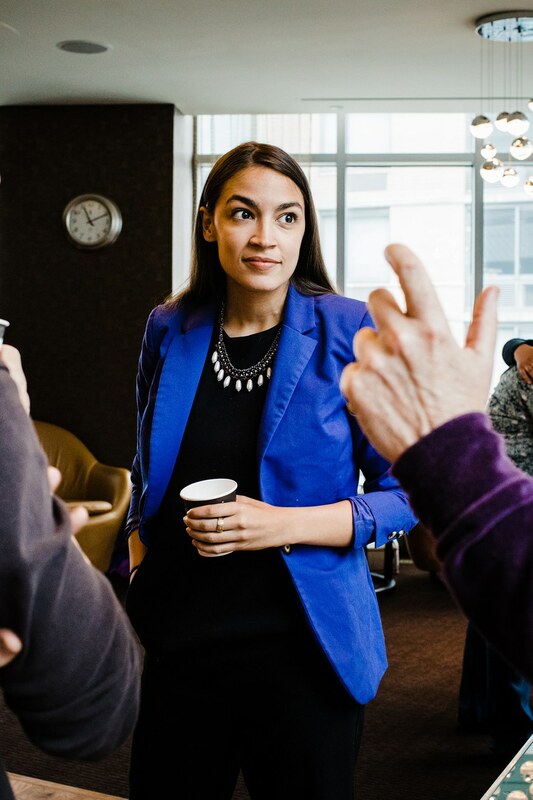 Since January 3, 2019, she has been the U.S. Representative for New York's 14th congressional district, which includes the eastern part of The Bronx and portions of north-central Queens in New York City. After college, Ocasio-Cortez moved back to the Bronx and found work as an educational director. Following the death of her father, she took on an additional job working as a bartender and waitress to help her mother—a house cleaner and school-bus driver—fight foreclosure of their home. Ocasio-Cortez later launched Brook Avenue Press, a publishing firm for books that portray the Bronx in a positive light. She worked as lead educational strategist at GAGEis, Inc. Ocasio-Cortez also worked for the nonprofit National Hispanic Institute, serving as the Educational Director of the 2017 Northeast Collegiate World Series, a five-day long program targeted at college-bound high school students from across the United States and other countries, where she also participated in the panel on the future of Latino leadership. On the first day of congressional orientation, Ocasio-Cortez participated in a climate change protest outside the office of House Minority Leader Nancy Pelosi. Ocasio-Cortez backed Pelosi's bid to be Speaker of the House once the Democratic Party reclaimed the majority on the condition that Pelosi "remains the most progressive candidate for speaker". When Ocasio-Cortez made her first speech on the floor of Congress, C-SPAN tweeted out the video. Within 12 hours, the video of her four-minute speech set the record as C-SPAN's most-watched Twitter video by a member of the House of Representatives. Speaking at a Congressional hearing with a panel of representatives from campaign finance watchdog groups, Ocasio-Cortez questioned the panel about ethics regulations as they apply to both the president and members of Congress. She asserted that no regulations prevent lawmakers "from being bought off by wealthy corporations". With more than 37.5 million views, the clip became the most-watched political video ever posted on Twitter. When President Trump's former lawyer Michael Cohen appeared before the Oversight Committee, Ocasio-Cortez asked him whether Trump had ever inflated property values for bank or insurance purposes and inquired where to get more information on the subject. Cohen's reply implied that Trump may have committed potential tax and bank fraud in his personal and business tax returns, financial statements and real-estate filings. David Brooks, a commentator for The New York Times, praised her for "laying down specific questions for specific predicates".